Now, economically, Sri Lanka is in a state of virtual bankruptcy, which cannot be controlled. Politically too, it is on the verge of anarchy. Fluctuations of political crisis affect the economic crisis while those of economic crisis affect the political crisis. Viewed from whatever angle, Sri Lanka is now in a situation of imminent fall into a great crisis. But it does not seem to have received the attention of the political leaders and the intelligentsia of the country. Instead, their full attention appears to have been focused on the forthcoming elections to be held according to the political agenda. As reported by the media, the Provincial Councils election is scheduled to be held before 31 May in one day. Thereafter, the Presidential election is due to be held on a day from 9 November to 9 December. The crisis that had been growing in the economic and political spheres may sometimes lead to disrupt the scheduled election timetable. Even if such an eventuality will not occur, the elections that will be held or their results may cause an explosive impact on the ongoing crisis of the country. In this context, the Constitution that we now have can be an important factor, causing a big mess. The Constitution we now have is more conducive to add to the present problems than solving them. Due to persistent violations, it has lost the consistency and the proper order that a constitution ought to have and had become an impotent and deformed entity. Therefore, now we are left with a constitution not effective in countering the crisis or containing it. It had become a source that would aggravate both the existing crisis and the new crises that may arise. Prior to introducing the 19th Amendment, the 2nd Republican Constitution of Sri Lanka had already become a distorted and weak document as a result of it being violated in a row by the ruling parties that came to power from time to time. It can be said that the 19th Amendment had brought the distortion and impotence of the Constitution to a climax rendering it a defaced and mutilated statute. Thus, the 19th Amendment itself can be considered the crudest and the major violation of the Constitution prior to it was violated by President Maithripala Sirisena in October 2018 by sacking the incumbent Prime Minister and later dissolving the Parliament. The violation of the Constitution through the 19th Amendment did not take place in secret. It was done in public and in a jubilant and euphoric atmosphere. The people did not notice the violation taking place as it had been done in the pretext of fulfilling several resounding election promises like the restoration of the system of independent commissions, abolition of 18th Amendment, granting the public the right to information and reduction of the powers and the official term of the President, etc. Abolishing the executive powers of the President and transferring same to the Prime Minister can be said to be the main objective of the 19th Amendment. Normally, the object of a simple constitutional amendment would be to make only a revision of the existing constitution. Adopting a new system of government changing the existing system is usually done by a new constitution and not by a mere amendment to the Constitution. It constitutes an accepted principle in constitution making. But the 19th Amendment can be considered only as callous and anti-constitutional attempt made to abolish the existing system and superimpose it with a new system of government by a simple amendment to the Constitution which was contrary to this principle. On the other hand, a simple amendment could be approved by a two-thirds majority of the Parliament. But, any significant transformation in the system of governance is required to be approved by the people at a referendum in addition to it being passed by a two-thirds majority of the Members of Parliament. Though the 19th Amendment can be considered a move to change the entire system of government, it had been drafted as an amendment that could be enacted by the approval of a two-thirds majority of the Members of Parliament. However, the Judiciary did not approve of this callous effort. The Judiciary ruled out that it should be approved by the people at a referendum in addition to it being passed by a two-thirds majority of the Members of Parliament if it is to be enacted as a bill. Following the ruling of the Judiciary, the next legitimate step taken should have been to abandon this informal and haphazard approach and work towards adopting a proper course of action to achieve this objective. But, what had really happened was to remove certain elements of the main object of the amendment and produce a new draft, incorporating only a part of the objective contained in the original draft of the amendment so that it would appear to be in conformity with the guidelines of the Judiciary and pass it by a two-thirds majority of the Parliament without submitting it even for a review by the Judiciary. It does not call for a deep knowledge of the subject of constitution making to realise that the manner in which the powers of the president was reduced by the 19th Amendment was a serious constitutional fraud which is contrary to the provisions enshrined in the Constitution itself. This can be considered a serious fraud committed by the Legislature to the public and the Judiciary. 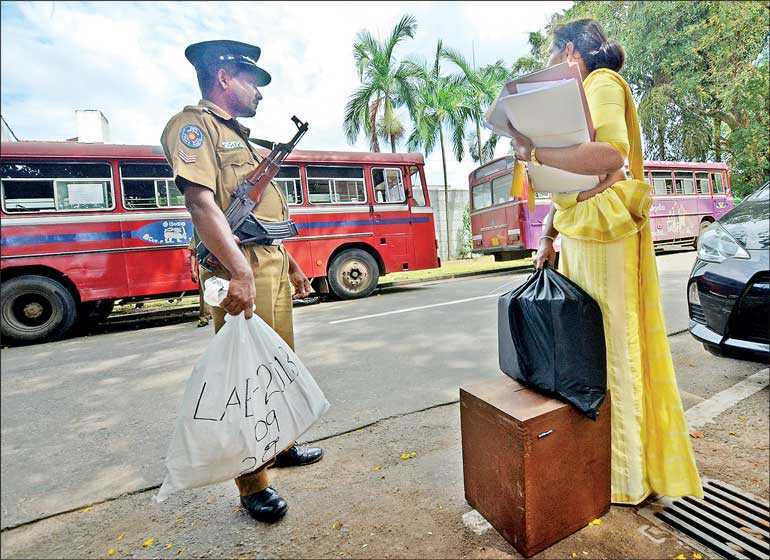 The 19th Amendment to the Constitution can be considered a product of the Yahapalana Government of Prime Minister Ranil Wickremesinghe and President Maithripala Sirisena. The UNP and its Leader Ranil Wickremesinghe had the potential of public support to secure the ruling power of the country after the rule of Mahinda Rajapaksa. But, Wickremesinghe lacked the self-confidence needed to contest against Mahinda Rajapaksa. Similarly, the UNP too did not have confidence in the candidacy of Ranil Wickremesinghe and his success. Ranil Wickremesinghe might have expected that it would be possible for him to make the common candidate, elected as the president with the support of the UNP, his political puppet. But, Maithripala Sirisena upon his victory was not prepared to be a political puppet of the Prime Minister. In this context, Ranil Wickremesinghe schemed to reduce the status of the president to a level of a nominal head of the state by making it a part of the common program of action of the Yahapalana Government and transfer the Executive powers to the Prime Minister by a simple amendment to the Constitution. The 19th Amendment can be reckoned to be the constitutional manoeuvring that he initiated to achieve this object. Despite the common agreement reached between the two leaders to abolish the executive presidency, Maithripala Sirisena, after being elected the President, did not like to see his executive powers removed totally. In this backdrop, the Prime Minister tried to achieve his objective through a subtle program, by way of the 19th Amendment aimed at transferring the executive powers on him without upsetting the President. As its original draft failed to receive the approval of the Judiciary, the Prime Minister was compelled to adopt a crafty approach to achieve his objective. The final outcome of this approach had been the creation of an irregular and lopsided Constitution that leads to cause a maximum distortion in the system of governance. Eventually, this situation, besides being absurd, has rendered the entire system of governance a confused mess with no consistency and proper order. The 19th Amendment reduced the powers of the president considerably and transferred them to the prime minister. Accordingly, the president lost the discretionary power of decision on who should be appointed the prime minister. Deciding on the cabinet of ministers also rests on the prime minister and not the president. The president has no power to change the prime minister or the cabinet of ministers. He cannot dissolve the Parliament until its official term is over unless the Government is defeated by a no confidence motion or by the defeat of the budget or the request by MPs to dissolve the Parliament with a two-thirds majority. Despite the fact that the 19th Amendment had deprived the President of most of his executive powers, conferring them on the Prime Minister, it has not been possible to reduce his status to a level of a mere nominal president. According to the Article 30(1) of the constitution, the president shall be the head of the state, the head of the executive and of the government, and the commander-in-chief of the armed forces. According to the Article 42(3) The president shall be a member of the cabinet of ministers and the head of the cabinet of ministers. The authority of appointing the secretary to the cabinet of ministers, secretaries of the prime minister and the cabinet ministers rests on the president. The biggest confusion and the most hilarious feature of this Constitution is that the President is selected by public vote treating the entire country as a single constituency, notwithstanding the fact that the president had been deprived of his executive powers to a considerable extent. Under the new system introduced and the changes effected, it is the prime minister, not the president, who can be considered the chief executive of the government. But, according to this Constitution, it is not the prime minister, but the president who is recognised to be not only the head of the state but also the head of the government. While the prime minister, who wields the executive power of the government, is elected from a local constituency, the president who has no executive powers in the rule of the government is elected from an island wide general election in which the entire country is treated as a single constituency. Even though the executive power of the government is vested in the prime minister, it is the president who represents the sovereignty of the people the most. This irregularity and the confusion in the distribution of powers between the president and the prime minister will inevitably lead to make the entire system of governance a chaotic mess. One of the serious faults of the new constitution is as follows. Appropriate measures should have been taken to remove the power the President had in dissolving the Parliament arbitrarily. But the way it had been implemented led to a bigger chaos. There can be special instances in which the Parliament needs to be dissolved due to the changes in the balance of power. In such situations, the continuity of the lifetime of the Parliament without dissolving it until its official term is over will necessarily create a chaos in the functioning of the government, making it a source of ridicule and disgust, earning the strong protest of the people. Prior to this change, all the powers had been concentrated in the President. With the 19th Amendment, a considerable share of this power had been deprived and transferred to the Prime Minister. But the system of government introduced by this change, in its final analysis, can be described as lacking consistency and order, leading to disputes and conflicts while causing the country to be pushed to a state of anarchy. Thus, the bequest of a mutilated constitution together with an equally-mutilated system of government can be considered as the final outcome of the 19th Amendment. The present situation of the country is not normal. It is sunk in a serious crisis. The mutilated Constitution and the mutilated system of government that we have inherited will not help abate the crisis except for aggravating it. Under the circumstance, making a new constitution can be said to have become an urgent need and a national requirement before anything else. If the elections are held in an atmosphere in which there is no proper constitution and a formal system of governance, it is likely to create a situation that leads to the emergence of constitutional crises. Such an eventuality will not augur well for the country in solving its present crisis and avoiding the country plunging into a complete anarchy. If the flight control signalling system of an aircraft breaks down while it is in flight, essentially the pilot should give prominence to the safety of the passengers rather than to the timetable of the journey. If the pilot decides to navigate the aircraft being more concerned with the time schedule thinking that the flight control signalling system could be rectified once the aircraft reaches its final destination, it can amount to a serious risk of playing with the lives of the passengers. It is important that the aircraft is navigated according to a timetable. Yet, if there is a serious technical fault in the aircraft, the prominence should be given to the rectification of the fault and not to the timetable. The pilot’s concern should be more on the safety of the passengers than the timetable. We can apply this analogy to the present situation of Sri Lanka, which is in a state of confusion in which the country does not have a proper constitution or a proper system of government. If it is decided to implement the election timetable to the letter without resolving this fundamental fault and the main confusion, it will invariably result in creating more confusion; and the country may even be plunged into a state of anarchy. Those of who are dreaming of a presidential election should not forget that there is a serious confusion in the provisions of the Constitution pertaining to the election of the president. The candidate elected for presidency must poll over 50% of the valid votes. In the event no candidate has satisfied this condition, the provisions introduced for selection of the winner cannot be considered practical or proper. The voter is entitled to express his second preference when there are two candidates contesting and a third preference if there are more than three candidates contesting the election. But, experience show that the voters of Sri Lanka do not use their second or third preference. This provision for second and third preference is made to be used as a basis for selecting the winner in an event no candidate has received more than 50% of the valid votes polled in the first round of voting. In such a situation, all other candidates except the two highest scoring candidates are eliminated from the contest and the winner is selected on the basis of the second and the third preference marked on the ballot papers of the candidates who were eliminated from the contest. But, as mentioned above, the Sri Lankan voters cannot be expected to indicate their second and third preference in voting. Therefore, in an event the highest scoring candidate polls less than 50% of valid votes it could invariably lead to a constitutional crisis in selecting the winner. So far, such a situation had not arisen in Sri Lanka. But, it is most likely to happen at the forthcoming presidential election. The provisions available in the French Constitution in this respect are precise and simple. It is a two-round system also known as the second ballot or runoff voting. The candidate aspiring to be the president should obtain a certain proportion of valid votes. If no one has polled the required proportion of votes, then all but the two candidates receiving the most votes are eliminated, and a second round of voting is held within two weeks. Only the two candidates who had received the highest number of votes will be entitled to the second round of voting. The above drawback is not the only fault in the Constitution of Sri Lanka that leads to create problems in the system of governance. It is only one fault. Now Sri Lanka can be considered a country without a proper constitution or a proper system of governance. Going for elections without rectifying these two fundamental errors will most probably result in the country ending up in a state of anarchy.